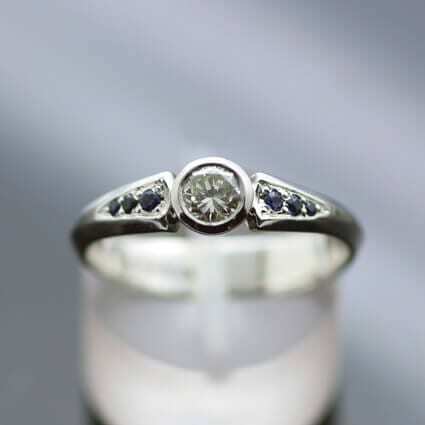 A glorious bespoke Diamond and Sapphire engagement ring inspired by the Villán Collection by Julian Stephens, created as a unique commissioned piece for a lucky client. This beautiful ring is based on Julian Stephens exclusive Villán design with an added splash of dramatic, opulent colour with pave set Sapphire shoulders added to the solid 14ct White Gold band. This fresh, modern engagement ring is finished with a glossy polished finish to enhance the lustre of the White Gold and the piece includes Julian Stephens exclusive maker’s mark and is fully Hallmarked.